When Audi introduces a new S model, enthusiasts sit up straight and listen. Don't even ask what happens when the German automaker rolls out two at a time, let alone three or four. But that's what Ingolstadt has in store for us in Frankfurt this year. Once the show opens in a couple of weeks from now, we'll have a new S6 (both sedan and Avant wagon), S7 and S8 on our hands. And they're looking pretty sweet so far. 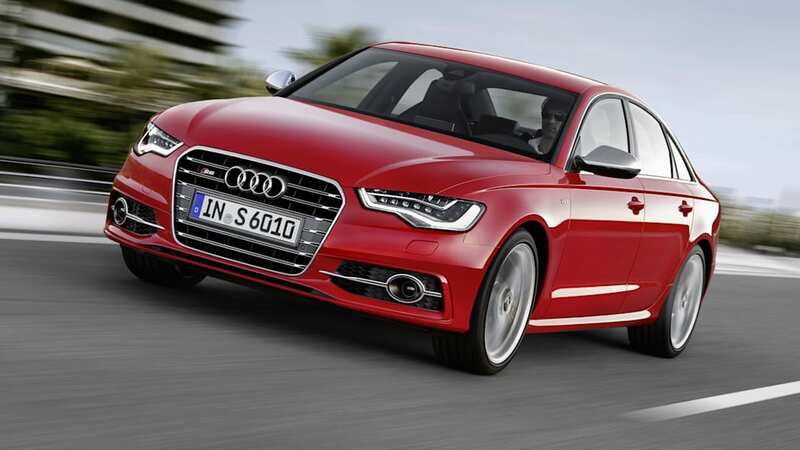 At the top of the heap is the new S8 sedan, which adopts the new twin-turbo 4.0-liter V8 that Audi has developed with Bentley, driving all four wheels through a seven-speed dual clutch gearbox. With 520 horsepower and 479 pound-feet of torque on tap, the big sedan is said to be good for a hugely fast 4.2-second sprint to 62 miles per hour and an electronically limited top speed of 155 mph. The S6 and S7, meanwhile, get a detuned version of the same turbo eight with 420 hp and 406 lb-ft of torque, good for 4.8 and 4.9-second acceleration runs, respectively. Cylinder deactivation and an active noise cancelation system are also part of the package on the entire range, and we're anticipating getting each of these models – minus the S6 Avant – in American showrooms. There's plenty more to delve into in the press release after the jump, so hop on in, and don't miss the high-resolution image gallery for a closer look. • Ground-breaking efficiency with systems such as "cylinder on demand"
INGOLSTADT, Germany, Aug 29, 2011 - Audi will present its new S models for the first time at the 2011 Frankfurt Auto Show (IAA). These models are characterized by power combined with appropriately low fuel consumption. 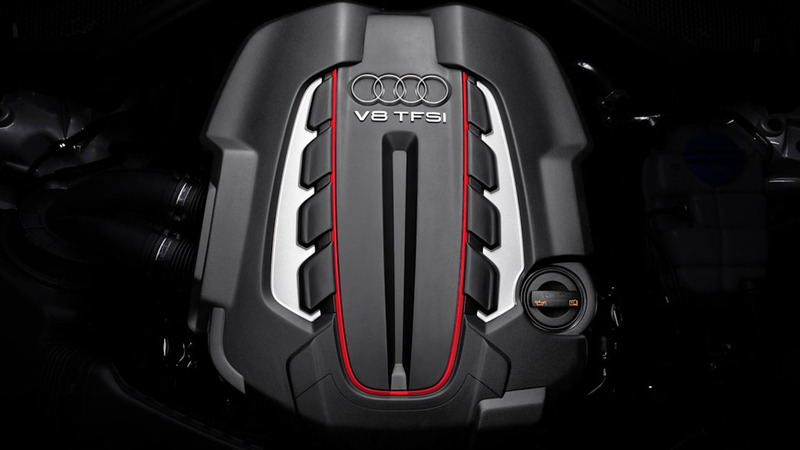 The engine down-sizing strategy of the brand with the four rings has reduced the fuel consumption of the S6 by as much as 25 percent whilst offering sportier driving performance. 25 percent. 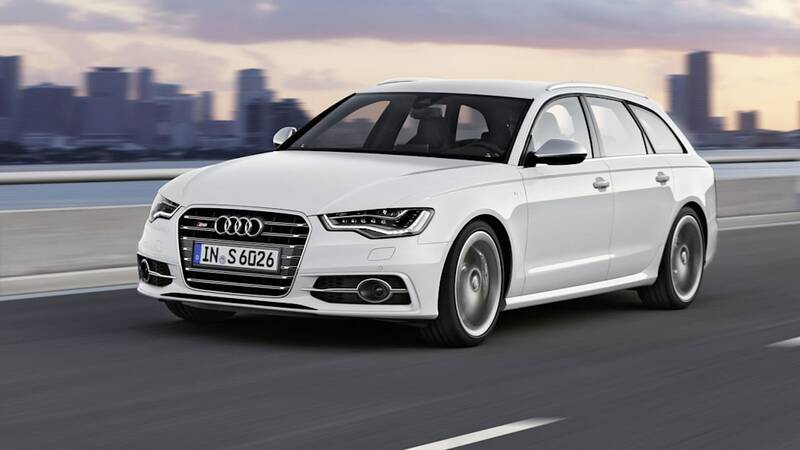 Average fuel consumption is just 9.7 liters per 100 km (24.25 US mpg) in the S6 and 9.8 liters (24.0 US mpg) in the S6 Avant, well below that of the competition. S models. These include LED headlights, adaptive light, the ambient lighting package, convenience key, head-up display, the parking system plus with 360° camera, power rear hatch, optionally with sensor control, and climate-controlled deluxe seats with massage function. The Audi S7 uses the same engine as the S6 and S6 Avant, the new 4.0 TFSI with 309 kW (420 hp) and 550 Nm (405.66 lb-ft) of torque. The twin-turbo V8 accelerates the five-door coupe from 0 to 100 km/h (62.14 mph) in 4.9 seconds, and top speed is limited to 250 km/h (155.34 mph). The cultivated eight-cylinder, which uses Audi's "cylinder on demand" technology under part load, consumes on average just 9.7 liters of fuel per 100 km (24.25 US mpg). 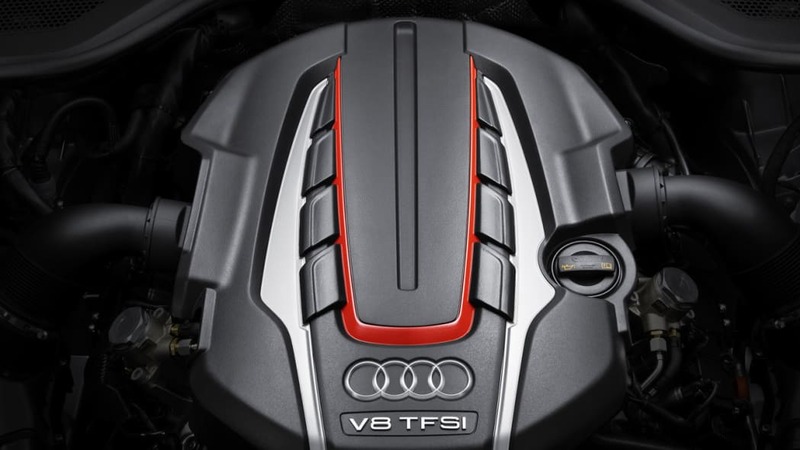 Power transmission in the Audi S7 is provided by the dynamic seven-speed S tronic and the quattro permanent all-wheel drive system with a self-locking center differential and torque vectoring. 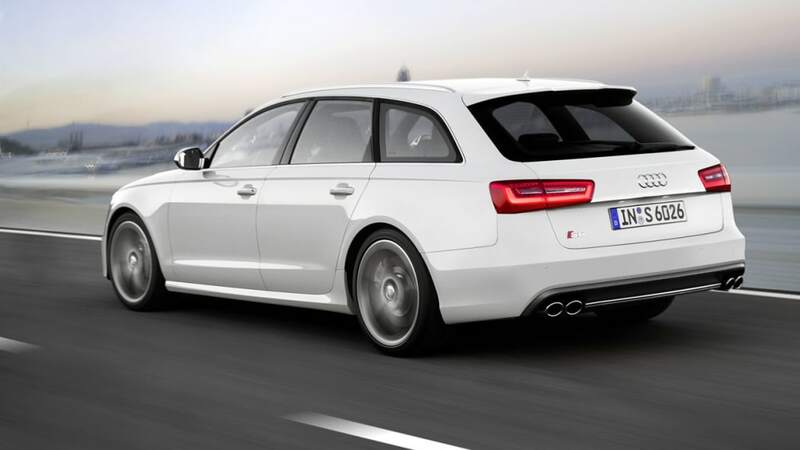 The optional sport differential from Audi distributes the power in variable proportions between the rear wheels. S7 logos up front. Carbon fiber-ceramic discs are available as an option. Other chassis options include 19- and 20-inch wheels and dynamic steering, which varies its ratio as a function of speed. 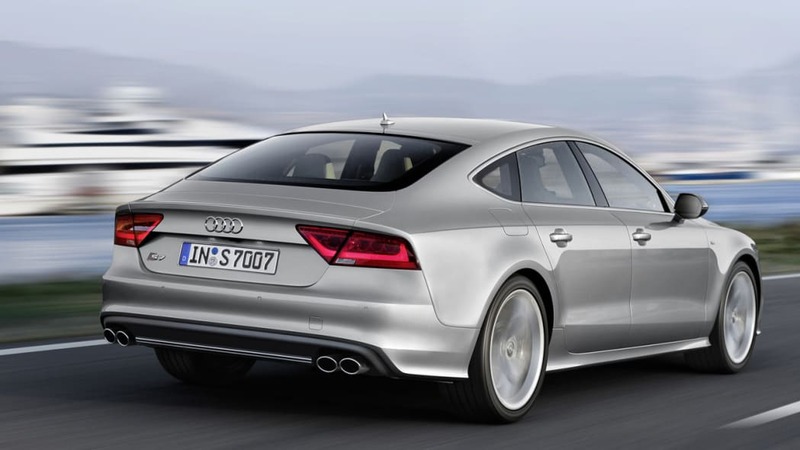 The design of the Audi S7 is seamless. The long engine hood, the long wheelbase and the short overhangs create perfect proportions. The low, dynamically tensioned roof line gives the five-door model the character of a coupe. At highway speeds, a rear spoiler extends from the rear hatch to improve stability. The S7 shows its sporty character in the interior, too. This can be seen in numerous details – the S badges, the red ring on the start-stop button, the S7 logo in the illuminated door sill trims, the aluminum strip on the S tronic selector lever and the aluminum shift paddles. The footrest and the pedals are made of stainless steel, and the soft keys of the MMI operating system are in an aluminum-look finish. 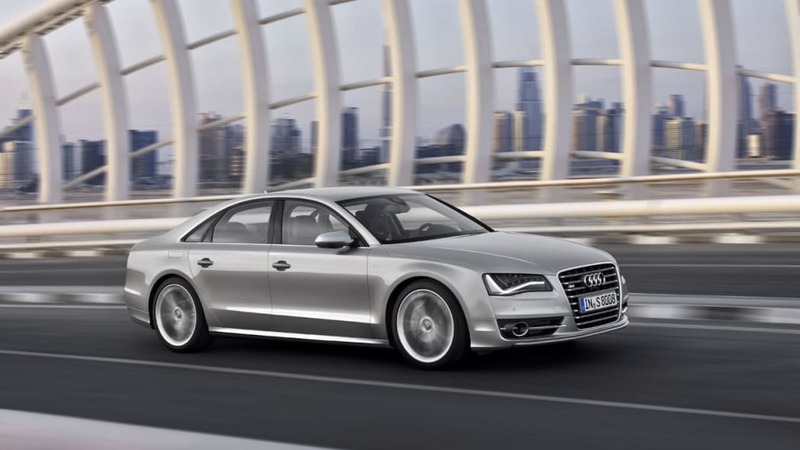 Audi equips the S7 with height-adjustable S sport seats with power lumbar supports as standard. Comfort seats and regular seats are available as options. The backrests of the S sport seats are embossed with S logos. 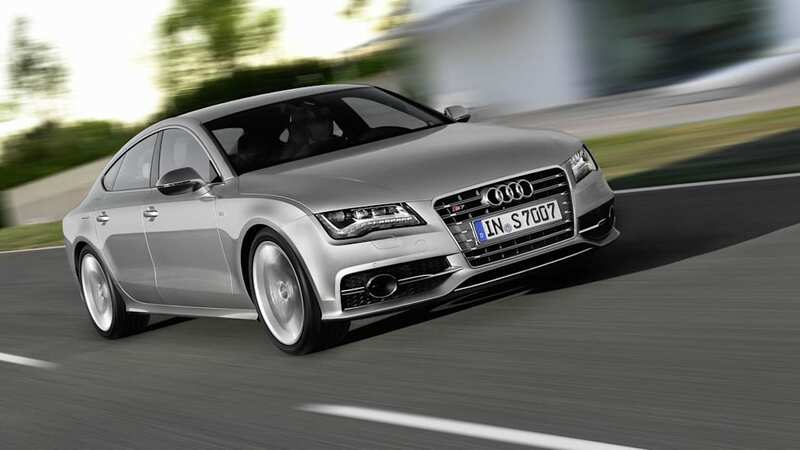 Delivery of the S7 is scheduled to begin in spring 2012. Among the standard equipment highlights are the xenon plus headlights with LED daytime running lights, the driver information system with color display and the versatile MMI radio plus audio and operating system. Both information hubs are easy to operate. The S7 can be optionally equipped with all of the high-end extras of the model series. Moreover, all driver assistance and infotainment systems are available, including the Bluetooth online car phone that connects the S7 with the Internet. (15.75 in) in diameter up front and 365 millimeters (14.37 in) at the rear. The matt black calipers up front bear S8 logos. Each of the optional carbon fiber-ceramic discs saves over five kilograms (11 lb) of weight. Their calipers are anthracite gray. The ESP stabilization program includes a sport mode, in which engine output is determined solely by the position of the pedals.